Charles Chaplin's The Gold Rush — his most successful film commercially and surely one of his greatest artistic triumphs — encapsulates everything that's great about the filmmaker's work. The physical comedy works on levels both broad and sublimely minuscule, the pathos at the film's core is moving without being cloying and the setpieces and effects feature an incredible attention to detail. Chaplin again stars as the Little Tramp, here known as the Lone Prospector, a hapless little fellow hoping to strike it rich alongside thousands of others during the Klondike gold rush. Originally released as a silent in 1925, the film was revisited in 1942 by Chaplin, who recut it, removed the intertitles and recorded a new narration track to make a rerelease more palatable to a generation mostly unfamiliar with silent films. Despite being Chaplin's preferred version, the 1942 cut seems far more anachronistic today and doesn't nearly reach the cinematic heights of its predecessor. Fortunately, Criterion has included both a reconstruction of the 1925 version alongside the rerelease, ensuring that Chaplin fans of all stripes ought to be happy. 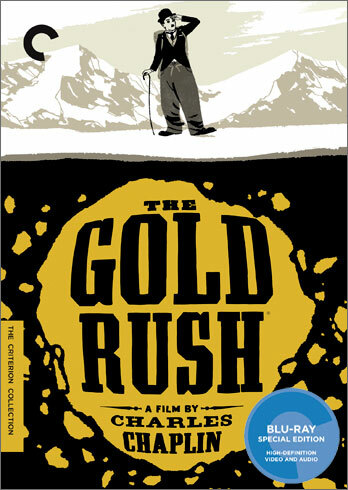 A fairly episodic film, The Gold Rush finds Chaplin stranded early in a rickety cabin with fellow prospector Big Jim McKay (Mack Swain), their travel halted by a severe storm. When the food supply evaporates, they're forced to get creative — Chaplin boils a boot, savoring its laces like noodles and picking every last bit of meat off the nail-bones, while Big Jim can't help but envision his companion as a delicious giant chicken. When the pair finally make it free, Chaplin discovers the beautiful Georgia (Georgia Hale) in a nearby town and promptly falls in love. His attempts to woo her are thwarted by his ragtag appearance and general lack of gentility, but that doesn't stop him from trying — or from imagining a lavish New Year's party thrown for Georgia and her friends, where he entertains them by transforming two rolls into ballet feet in what might be the film's greatest sequence. After the slapstick of act one and the heart-tugging of act two, Chaplin stages an impressive adventure arc in the final act as the Tramp and Big Jim reunite to find his lost claim and end up on the edge of a steep precipice. Seamlessly blending miniatures and full sets and incorporating a host of in-camera tricks, the sequence is just another testament to Chaplin's diverse talents. Both versions of the film are given a 1080p high definition transfer in their original 1.33:1 aspect ratios. The 1925 version receives a 2K digital restoration of the 1993 reconstruction by Kevin Brownlow and David Gill. For all the neglect it's undergone, the silent version looks pretty strong — damage has been reduced greatly, black and white levels are stable and fine detail is often striking. The image is never especially sharp, but all things considered, it's a big step up. The 1942 version naturally looks sharper and cleaner, with stronger details and much less damage. The 1925 version is accompanied by a 5.1 DTS-HD Master Audio track of a newly recorded adaptation of Chaplin's original score. The 1942 version comes with an uncompressed monaural soundtrack that is quite clean and robust. Chaplin biographer Jeffrey Vance offers up an audio commentary for the 1925 version (all but cementing the idea that despite Chaplin's beliefs, the silent cut is the true Gold Rush), three new featurettes focus on the film's rerelease and reconstruction, its visual effects and its music, and a basic making-of piece from the original DVD also makes it over. Four trailers and a booklet with an essay by Luc Sante and a reprint of James Agee's review of the 1942 cut round out the supplements. The latest feature-rich Chaplin release from Criterion comes as highly recommended as Modern Times and The Great Dictator before it.